Maybe Ground-Ball Pitchers Actually Are a Bad Bet? Make a list of the best pitchers in baseball. Make a list of the best pitchers in baseball, in any era, and what you will find is that 80% of them are not ground ball pitchers. They’re fly ball pitchers. Bill Petti illustrated fairly conclusively that heavy ground-ball guys didn’t have more arm injuries and didn’t have more severe injuries. Russell Carleton followed up with a piece that showed that ground-ball rate did not improve injury prediction for the elbow or the shoulder. And so we wiped our hands and moved on. Except that we forgot a main thrust of what James said, which is that ground ball pitchers don’t last long. 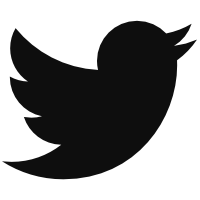 Craig Wright, in a response to the post, did a good job of putting it in a different context: “In doing aging profiles for pitchers during my career, I downgraded extreme groundball pitchers because they tended to show more reactive responses to abuse setting off premature aging syndrome (PAS) and also to the normal aging response,” he wrote. Well, that’s something different. And I haven’t seen a repudiation of that portion of his claims. Do ground-ball pitchers age poorer than the regular population? And is it a function of sinker usage, since more internal rotation on the shoulder could lead to more shoulder problems and decreased performance even if it doesn’t show in injury data? I asked Jeff Zimmerman to work up the aging curves for three groups: all pitchers, all pitchers with a ground-ball rate over 50%, and sinker-heavy pitchers (usage rate of 30% or more). Here’s how runs allowed per nine innings age, year to year, for the three groups. By including sinkers in this graph, we’re limiting ourselves to aging since 2008. 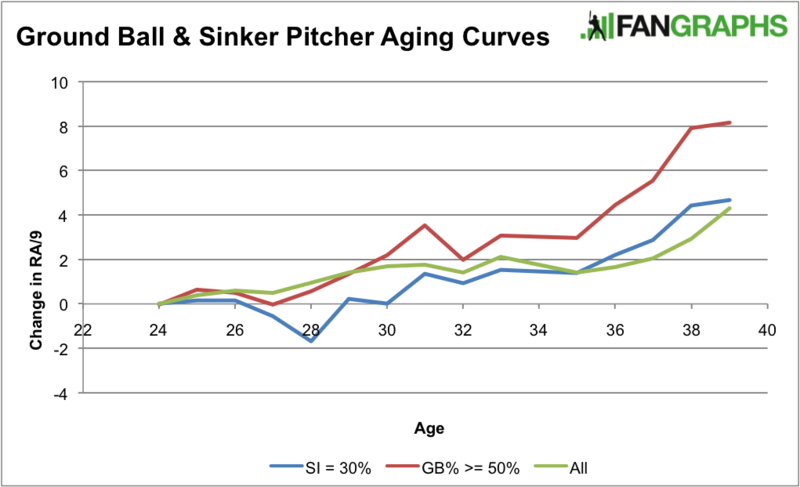 So the sample on the sinker aging curve isn’t great — between 28 and 34, where it looks like sinker-ballers age better than the regular population, the buckets average nearly 400 innings. The “all pitchers” curve averages over 2000. So let’s call that sinker curve inconclusive. The ground-ball curve, though? The buckets average 600 innings and are closer to half the size of the “all” curve in most spots, and there are no missing ages. It certainly looks like James was right: right around 30 years old, ground-ball guys start to age worse. They add four runs to their peak RA/9 two years earlier than the average pitcher. The attrition is much worse, too: between 32 and 34 years old, 34% of all innings pitched leave the game, while 74% of all innings pitched by plus ground-ball pitchers disappear. That’s a startling number, actually. But look at the number of 30-year olds who reached qualified status with 50% ground-ball rate or higher last year. Only two of them will pitch next year. Expand the search to include pitchers about to turn thirty, and we start to see a fresh crop that will test the truism. Felix Hernandez and Jake Arrieta are most famously at the top of the heap, but the list is fascinating. Four years from now, we’re likely to be looking at two or three of these guys still pitching. Say it ain’t so. We hoped you liked reading Maybe Ground-Ball Pitchers Actually Are a Bad Bet? by Eno Sarris! Do ground ball pitchers with a high K% age better than those with low K%?